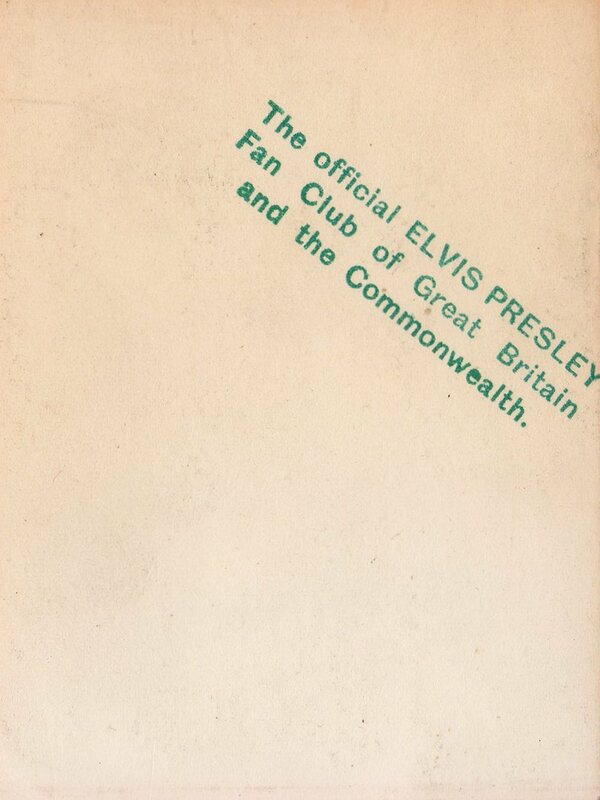 The OEPFC (The Official Elvis Presley Fan Club of Great Britain And The Commonwealth) may not have been the first Elvis Presley Fan Club in the United Kingdom as several local clubs are known to have existed from mid ’56 onwards, and it has been said that the OEPFC had been formed in protest as some of these smaller clubs had been ripping off fans. But, when JEANNE SAWORD and DUG SURTEES formed the first national Fan Club around June/July 1957, they could never have envisaged the success story that would follow over the years. As an introduction to a series of rare and early OEPFC Newsletters and Journals on Echoes, we start this series off with a brief history of the beginning years of the largest (and still standing) Fan Club in the world. – JOURNAL October 1957 SOON! An announcement was made through the Press in the early months of the summer of ’57 that the OEPFC would be launched. 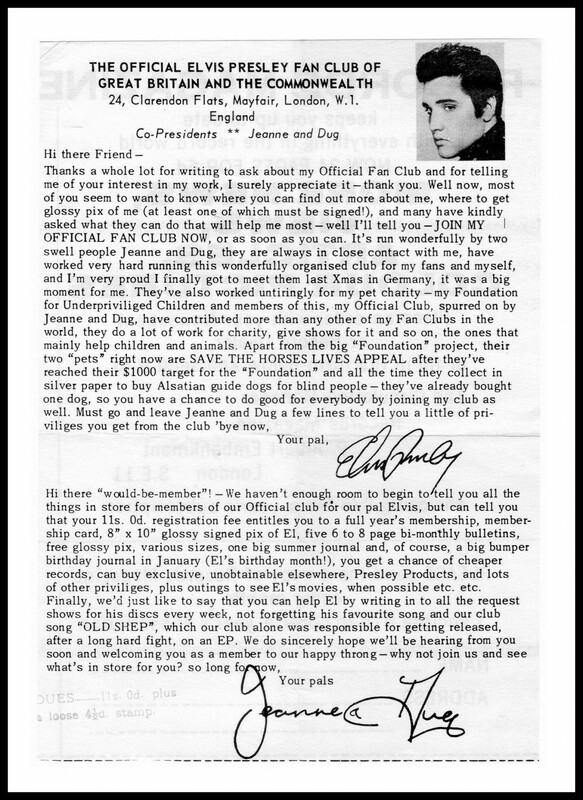 The Fan Club formally started on the 2nd of August and the first newsletter was issued that same month. It was run from a basement on Manchester High Street in London, though it had a rather upmarket-sounding mailbox address: 24 Clarendon Flats, Mayfair, in West London. Though initially not large in numbers, in the low 100’s, a surge in support, with subscribers who paid 11/-d (55p) fees, from across the UK and around the world resulted in additional people being brought in to help out as the subscriptions soured over the 1000 mark within two months. The membership rose steadily and in January 1958 had reached 3000, by December of that year there were more than 6000 members. This encouraged Jeanne and Doug to register the Fan Club as a business in late 1958 and give up their regular jobs to work full time on the Club. To the right we see an advert for the OEPFC from late 1959. By this point the member-count had gone over 7000. Initially newsletters were issued on a monthly basis, but after two issues it was clear that the work involved producing them couldn’t be maintained and it was changed to a bi-monthly issue. Twice a year, rather than receiving a bi-monthly issue, a much larger Journal would be issued, the first of which was issued in October 1957. When the Fan Club thought it necessary, additional bulletins sheets would be sent out. 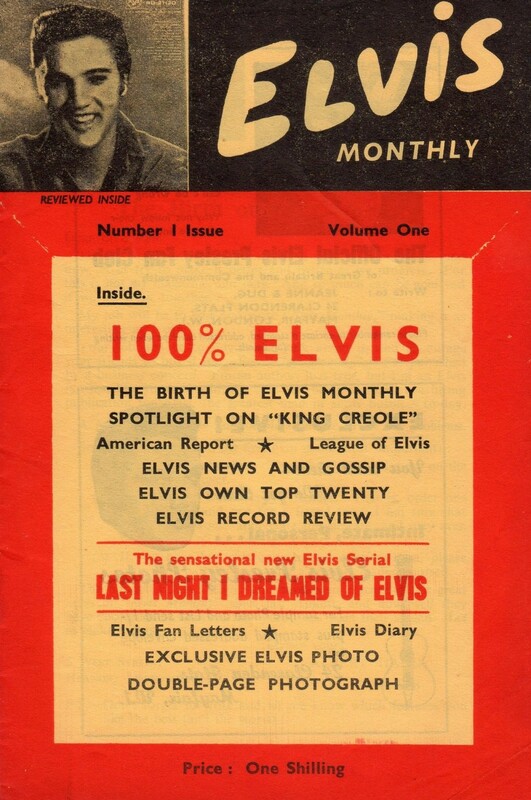 These newsletters were crammed with all things Elvis, giving a contemporary snapshot in time, with reviews by fans of concerts, records, films, quotes, pen-pals and items for sale, as it was happening at the birth of Rock ‘n’ Roll. These (at times amateurish) publications had a few problems. Some were on very thin paper and the text on the opposite side could be seen through, while others (for example the January 1958 Journal) were printed on green paper and for an inexplicable reason it was chosen to print the text with a different shade of green ink, which made them extremely difficult to read. 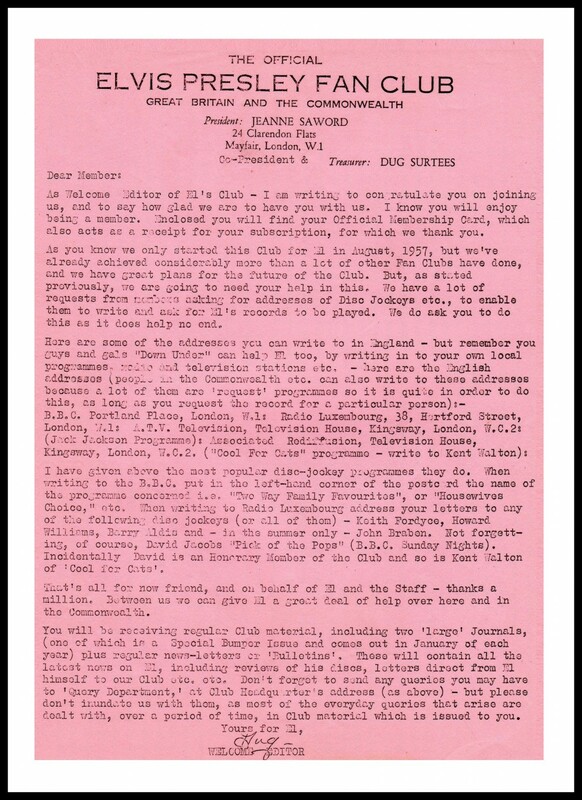 Several different welcome letters had been sent out to potential members who had shown an interest in joining the Fan Club. To the left we have a letter dating back to the early beginnings while on the right we can find a welcome letter from a later date that includes a few words by Elvis himself. 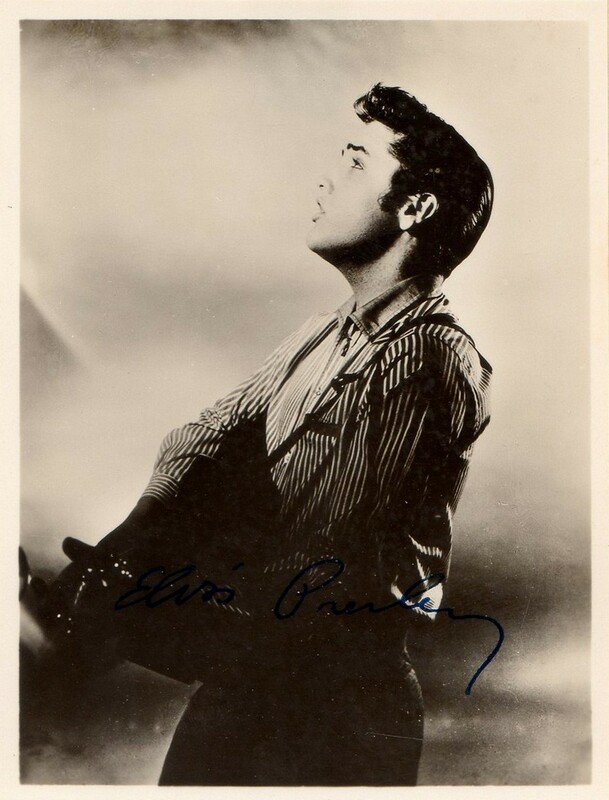 From the outset, the Club included photographs of Elvis with their newsletters and other correspondence. Many of the pictures were meant to be stuck into newsletters, where spaces had been left open. As there has never been a list produced of these photographs it is impossible to tell how many different ones were given away over the years, but they are numerous. What is noticeable is that they were not all Fan Club produced as several were promotional items given to the Fan Club by film and record companies and then distributed by the Club who put their own stamp on them. Displayed here are the front and back of the 3″ x 4″ photo from Loving You that was included with the first issue (August 1957). Included with the newsletters were specially produced items and promo materials. To the left we have a 4-PAGE SHEET advertising Albert Hand’s A Century Of Elvis and The Elvis They Dig. This sheet was included with the June 1959 Journal. The GUMMED STICKERS to the right, came with the November/December 1959 issue. Around late 1957, the first exclusive Fan Club badge was commissioned. This metallic, silver coloured badge with red enamel cost 2/6d (12.1/2p) and was available for several years, throughout the late 50’s. Clean examples of these badges are now highly sought-after, as they had, with use, a tendency to chip and rust. Here we have a membership card from early 1959. 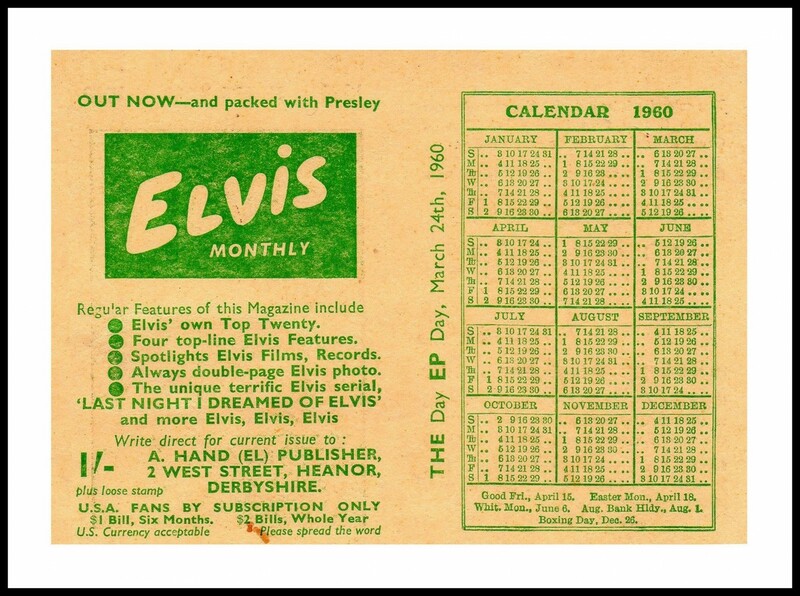 In early 1960, the OEPFC issued a foldable Pocket Calendar for the year that would mark Elvis’ return from Germany. 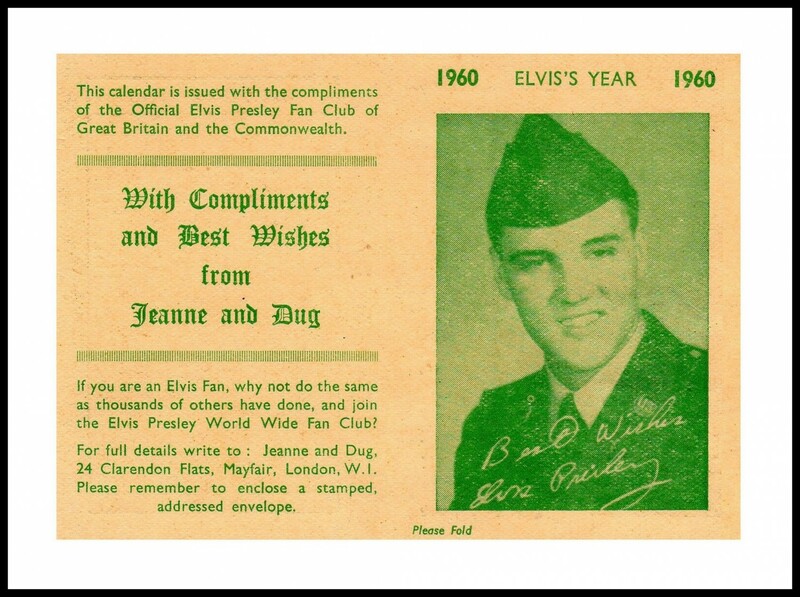 We can also see that information has been added regarding Elvis Monthly. In February 1960, ALBERT HAND launched the first ELVIS MONTHLY. This magazine would become the longest running monthly about a single artist (running for 483 issues), and be forever associated with the OEPFC. During the early 60’s, the OEPFC continued as it had since 1957. Then unexpectedly, due to personal commitments, Jeanne and Doug announced they were to cease running the Fan Club, issuing their last newsletter in January of 1962 (which was in fact a single page explanation). 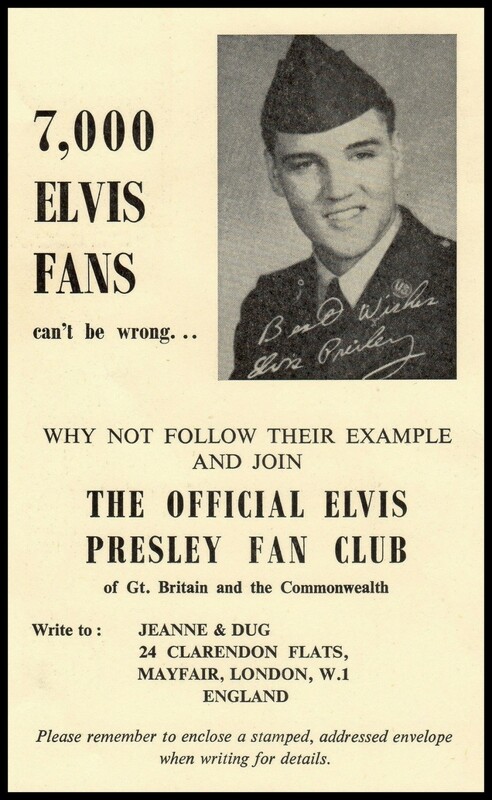 The original Fan Club officially closed down on the 31st March 1962. From the following day (1st April) the OEPFC would be run, with the blessing of Jeanne and Doug, by Albert Hand. Albert who had supported the Fan Club over the years, and was well known by fans through his publications, would rejuvenate the Fan Club taking the Club to another level. 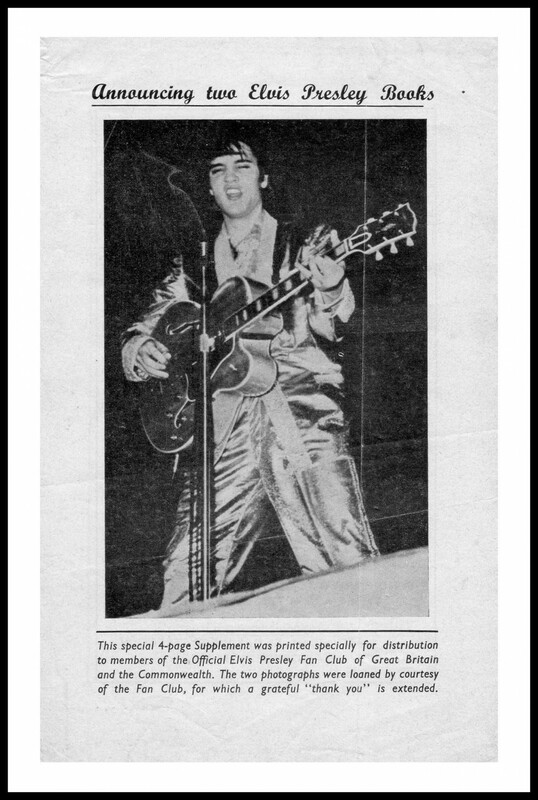 With Albert taking over, he introduced a new newsletter entitled THE ELVIS EXPRESS which came out in April 1962. Now the Fan Club would be operated from Albert’s Heanor address in Derbyshire. Heanor would now become the centre of operations for both the OEPFC and the Worldwide Fan Club from the 1st April 1962. 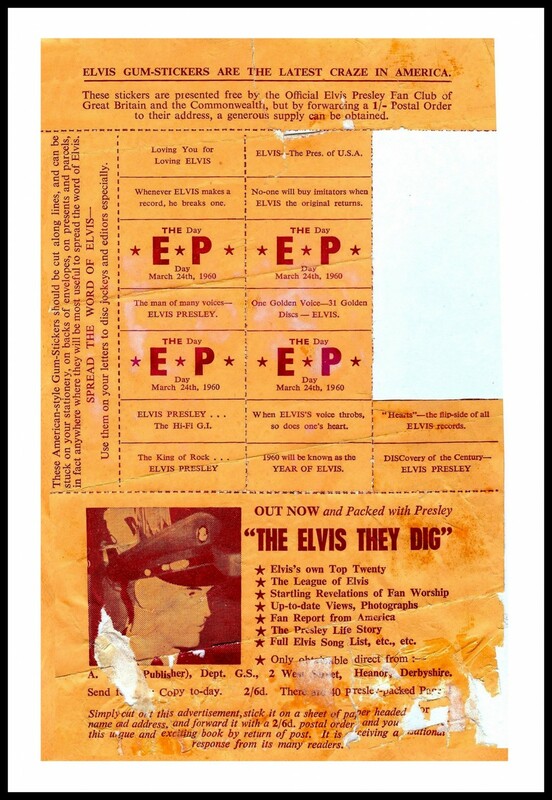 The Worldwide Elvis Fan Club had originally been set up in April 1959 by Albert, to allow fans to purchase Elvis records from around the world and at discounts. Handing over the Fan Club to Albert was inspired as he would take it to new heights. His background as a printer meant he knew how to promote the Fan Club (through quality printing) as his influence saw the Fan Club producing countless publications. Albert would run the Club until 1967 when TODD SLAUGHTER (who continues to run it today) took over and turned it into a flourishing business. * The market is very limited for these wonderful newsletters, and with very few of the earliest copies surviving, they are hard to track down, but the time spent finding them is rewarded by some true collectors-gold. 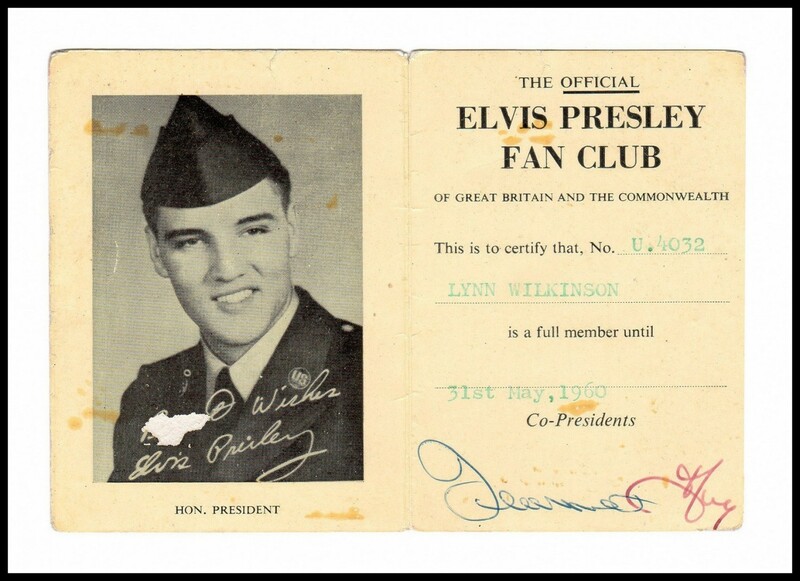 Early American Elvis collectables, including Fan Club items, have been well documented in various publications, but similar early UK collectables have never been treated in the same way, with many remaining unknown to the majority of collectors. The information included here on Echoes is the most detailed collection put together of UK Fan Club items from its formation years. * It has to be noted that the newsletters vary considerably in size, from single page issues to sixty page issues. The journals are typically 8″ x 10″ in size. The bi-monthly issues can range from the old foolscap folio (8″ x 13″) down to a half sheet 6.5″ x 8″. Some newsletters are simply sheets stapled in the top left corner while others are in booklet format stapled in the bind. There is no obvious reasoning as to why or which from was used at any given time. * Many of the newsletters came with bonus photographs, and also these photos come in varying sizes from 8″ x 10″ down to 2.5″ x 3.5″. Once again, there has never been a publication showing these, and for this reason it is unknown exactly how many different ones were issued. All items displayed in this article are from the private collection of HARRY CARRIGAN. Harry is also responsible for the text supplied on this page. My sincere thanks and utmost appreciation for sharing his collection and knowledge with the visitors of Echoes goes out to Harry! Thanks Harry, some of this is completely new to me, BRILLIANT. badge a lot. It’s a wonderful collection. I hope you & Harry will receive a lot of happy feedback. My wife has a mint condition OEPFC Badge, and is curious as to it’s value. Any one out there have any ideas? We thought that the OEPFC 1957 badge because of it’s rarity would be worth more than £10, but hey-ho my wife loves it and has kept it all these years. Mike, on a good day you might find someone paying 20 pounds for the badge. first 2 years still have collectors value. But not many collectors around anymore. 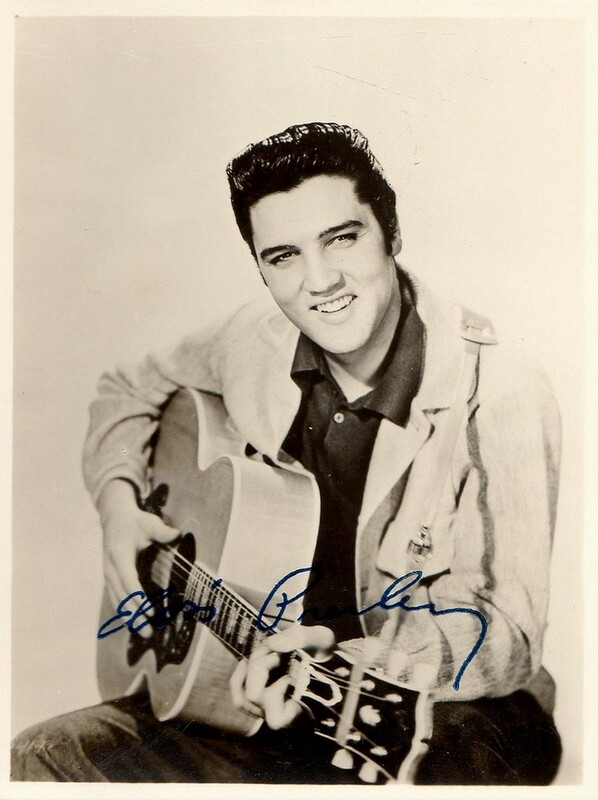 Hi, I’m trying to find out what brand of hair rinse Elvis used? As a tribute to Elvis Presley, I decided to draw a very fine picture of him. I sent this drawing in the hope that it would be recognized for its originality. The drawing took me 695 hours to complete. My intension was to draw a picture that would be a fitting tribute to a singer whose voice and talent, captivated audiences worldwide. After completing this drawing I was advised to send a copy to America. I sent a copy of the original drawing to Geissler Park Bear Delaware 19701. Mr Geissler acknowledged this drawing as exceptionally remarkable and thanked me for sharing my talent with them. Mr Geissler was a family member who looked after much of Elvis Presley interests. I also received a signed letter from the Elvis Presley British Fan Club signed by Todd Slaughter and Vicky Malloy stating that my work was a fine example and tribute to Elvis Presley and suggested that I submit my work worldwide. 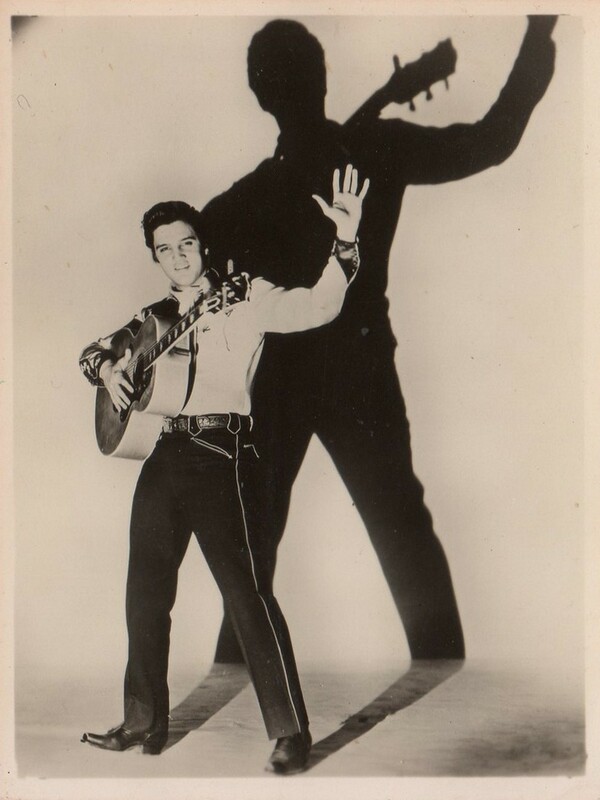 I now go on in my quest to share my work with all who loved Elvis Presley. Prints are now available of my work on request. I have attached a copy of the original. If you are interested in my work please do not hesitate to contact me. Hello, my name is Daniel, my mother is Jeanne Saword and I just wanted to clarify that the Fan Club was not in Manchester but on Manchester High ST in London. Thank you very much for taking the time to comment Daniel. I have corrected the article with your information. Hi, I am one of the first members of the Fan Club. I joined in July 1957. I’ve been in touch with Doug Surtees through the years. He moved back to Australia and died there, aged 91, on October 11th 2017.